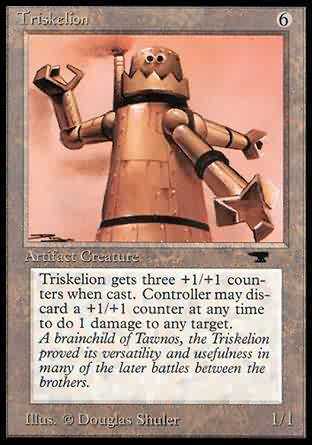 Triskelion gets three +1/+1 counters when cast. Controller may discard a +1/+1 counter at any time to do 1 damage to any target. A brainchild of Tawnos, the Triskelion proved its versatility ans usefulness in many of the later battles between the brothers.